philosophy: where there is hope, there can be faith. where there is faith, miracles can occur. 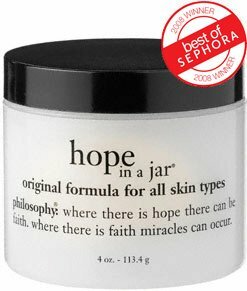 hope in a jar is a world-famous, daily facial moisturizer originally created for the medical market to help reduce the appearance of wrinkles, skin discoloration, rough texture and dehydration. hope in a jar is an award-winning facial skin care cream loaded with antioxidants in a unique souffl�� texture. it hydrates the skin to reduce dryness as it gently exfoliates to leave skin smoother, healthier and more radiant. I used this product for more than 3 weeks before I decided I liked it. Initially I thought it was too light and the scent is very odd. It reminds me off that fake plastic doll hair smell. But I decided to stick with it and see what I thought after a month. Now I love it. It's light and has that whipped texture. It absorbs quickly and my skin is super soft. My makeup is going on smoothly and I even have rosey cheeks which I have never had. I haven't changed anything but my moisturizer so I will attribute the positive results to this product. I like that I can use the Bare minerals over it without it clinging to the moisture. Honestly...you must try this product! I read many reviews that the philosophy products are really good for all types of skins, so I trusted all reviews I read and purchased this facial mositurizer. I read a review that it smells like rose, but mine is more likely an ointment... I really dislike it! It really is hope in a jar!